Blog Home > Inventory Management > What’s the Right Warehouse Rack System for Your Operation? A warehouse rack system is a humble part of any storage operation that can quietly make or break its success. While that may sound dramatic, it’s a fact that in a warehouse or distribution center a rack system is at the core of operations. It’s involved in several stages of operations and it follows that it should be carefully considered. 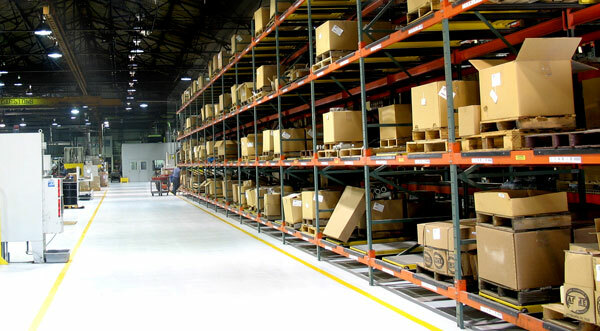 The good news is warehouse racking systems are available in many different configurations. Most can be customized to suit your warehouse’s specific space and business needs, fill the cube and operate in most any way you’d like. Whether you are storing pallets, beverage loads, heavy components, furniture, food, cartons or any other load, rack systems can be designed to fit your application. To get a better idea of the ideal configuration (which may involve different types of rack systems), first examine these six application factors. Then, we’ll discuss a variety of rack options and the type of warehouse they work best in. Weight, size and shape: Knowing what needs to be stored by weight, size, and shape, is the first step in determining the right storage options. Weight is a critical factor from a safety perspective – storing a heavy load on a rack system not designed to bear the weight will result in collapses, product damage—or worse. Keep in mind, pallets and product should be stored with the proper clearance. Inventory Rotation: Is your operation a first-in, last-out operation? Or a last-in, first-out? How often do you need access to certain inventory? Accessibility: Think about these types of questions: Does it all have to be available at all times? Can less used items be stored in a double stack? Warehouse specifications: Knowing and understanding space limitations is critical in implementing an appropriate rack system that both works and fits into the available space – with room for machines like fork lifts to maneuver around. Also consider vertical space. Type of equipment: Whether it’s forklifts or cranes, think about not only the type of equipment, but how it will be used (i.e., a drive-through, drive-in, or other configuration). Throughput of inventory: How much inventory do you have and how often does it change over? Make sure to allow for growth potential. Now, with a solid framework on which to consider warehouse rack system options, let’s discuss some of the options available. A versatile choice, selective pallet racks are the world’s most common pallet storage system. Their greatest benefit is accessibility: Every pallet can be easily accessed at any time. They allow for 100 percent selectivity to every pallet position and, if needed, every pallet position can house a different SKU and the storage mix can easily be adjusted. In a high throughput facility, this is often the best choice. This storage rack system is not ideal for warehouses in need of high storage density as there must be a forklift aisle for every storage position. For awkward sized, long, or heavy material, cantilever racks work well. They accommodate piping, lumber, tubing, and other heavy/long items – and keep them all accessible with a cantilever rack. The cantilever design allows for easy forklift access of challenging product. Cantilever rack is frequently used to store furniture and other loads that don’t work well in a contained pallet rack position. If high-density storage is a necessity for your business, then drive-in or drive-through pallet storage racks are a good choice. The arrangement allows for deeper storage, with less aisle space. The increased density comes at the cost of selectively. Depending on storage design, product is available on the basis of a first-in, first-out or last-in, first-out system. With a drive-in rack, a lift truck enters from one side to drop off or pull out pallets. Once it has retrieved a pallet, it backs out of the rack and continues on its way. Pallets can slide on a continuous rail to allow for more product to be added. 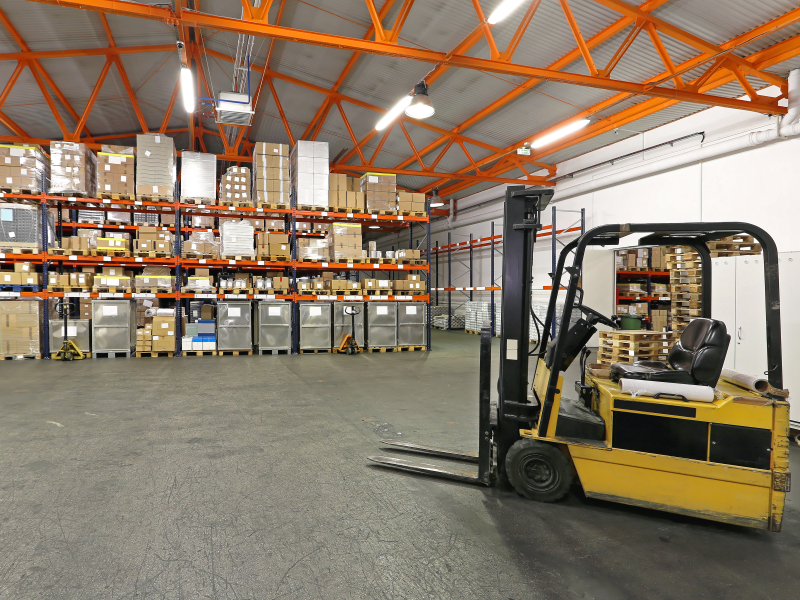 For pallets stored two or more deep, forklifts can drive in to access. Drive-in racks are often used in cooler or freezer applications due to space constraints. Drive through racks allow trucks to enter or exit from either side of the rack structure, where drive-in racks are entered from only one side. If a single point of access is too limiting for your operations, consider drive-through rack systems. This setup has two access points (from either side of the rack structure) and allows pallets to be picked or replenished from either direction. While not a true first-in, first-out storage product, drive-through provides more flexibility than drive-in, and can simulate FIFO principles. Both drive-in and drive-through racks work best when there is a large amount of similar items that can be stored in a single pallet position. Another variation of rack storage with two access points is a pallet flow rack. In this first-in, first-out system, pallets are loaded at one end and unloaded at the other. 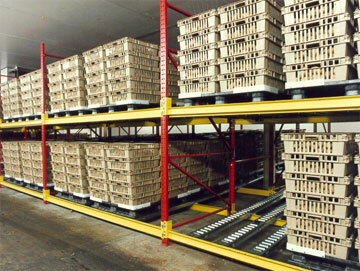 Pallet flow racks address two key priorities: inventory rotation and storage density. This rack system works well with perishable or time-sensitive goods, such as food or pharmaceuticals. Other benefits include automatic product rotation, less material handling, and space savings. volume, and throughput. 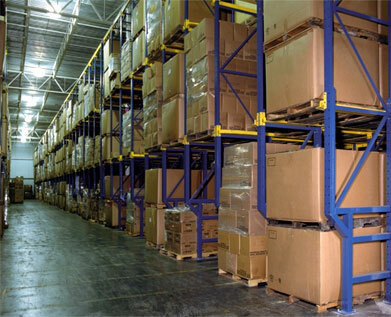 Systems like over-dock storage racks take advantage of lost space in a warehouse. Specialized storage solutions, for items like record file boxes or bulk racks, solve specific storage challenges. Existing storage racks can be retrofitted to align with modern needs. For example, a drive-in rack can be retrofitted with horizontal pallet flow lanes to increase storage density and enhance rack safety as it eliminates the need to enter the racking.